I’m very very excited about reading this book! I started with the company January 1st, 2008, I did all my learning, developing, and growing during that wave of Starbucks change. I’m very proud of myself and my accomplishments within the company, and proud to say that I’m a part of such a wonderful company. I will definitely read this book when it becomes available….but interesting you should mention the Starbucks event in New Orleans (post-Katrina) I would say after that event was the most positive I have ever seen my local store manager, with her describing all the things that went on, etc. But since then, with the store closings, the labor (time) being cut for stores, the rotating parade of new district-managers, the VIA push and countless other things, her enthusiasm has waned. I think this book is very special…I was really stunned by the first impressions that I had, when it has arrived. The cover is made very cool (feels interesting) and there are many nice images of all kind of milestones in Starbucks’ history inside. 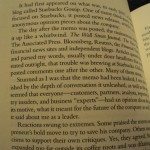 I can just agree…the book is very emotional and to me, personally, it is very interesting to see what kind of strange decisions an international company like Starbucks has to make sometimes to stay successful. 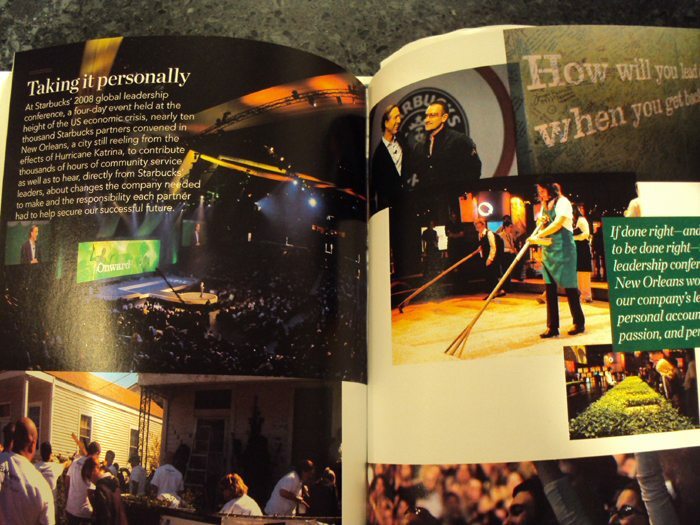 But at Starbucks, they are never leaving out the human aspect or sustainability in their decisions. Onward really conveys that very well to the reader. Thanks for the great review Melody. The part about the partners in New Orleans is something I am looking forward to reading more about. Howard/Starbucks are at their best during times like this. My wife is Japanese and Starbucks Japan has donated 1.2 Million Dollars to assist in efforts there. Awesome. Also, best wishes to Kaori from Bucked by the Star. Melody sounds like an interesting book and look forward to reading it. I also very much find his mantra interesting. I am not sure yet if they have accomplished this mantra. I see such diversion of customer service from one day to the next. Thank you again for sharing your review. @purple1 – I read your comment, then I re read my review, and then I read your comment, and then I took out the words about “mantra.” Not sure that’s the right words! There is a theme in the book about getting back to core principles that made them successful, but mantra implies that those words are repeated often throughout the book, and in hindsight, that’s a poor choice of words on my part! @Sebastian – It is great to hear from you! You’re one of the few people who have read the book, who I know!! Emotional I think is such a great word for the tone of voice of the book. Pour Your Heart Into It somehow seemed less raw than this book. Thanks for the comment. Thanks for the preview/review – I am now quite excited to read this book. I was apprehensive at first, concerned that it was just a marketing piece (much like the books presidential candidates write before they announce their candidacy). The quote from page 40 has really piqued my interest. Can’t wait until the 29th. Does anyone know when store partners get their copies? I would imagine that it must be pretty soon! Are any of my readers going to read their partner copy? Everyone I’ve spoken to doubts they will arrive by Fedex and assumes they will arrive in a regular “order,” which means the arrival will vary from store to store. Usually, as with rollouts, the retail arrives a few days in advance with material stating not to open until the specified date. I’m expecting ours to arrive by next Sunday at the latest. What a beautifully written review Melody! Thank you! I ordered the book thru you, so hopefuly will be able to read it fairly soon. I look forward to it very much, and I can also feel a pang of….. apprehension. 2008 was a very sad yr for me, losing my dad. Then, at the same time, Sbux was all changed when I re-emerged in my tears and found PPR. and we all know the rest of that story. And, I agree with you, of course, about the ‘aroma’ (or lack of it) etc. BUT, overall, it souds like a heartfelt book. I hope he’s (H.S. )sincere about returning to some of those roots…. Hi Joshua! I had no idea that the partner versions of the books would show up sort of in due course with the order. I would have thought that you’d be getting the book about now – That would give you plenty of time to read the book, in case customers have questions! Welcome to the blog too! Interesting that the stores are getting copies of the book. Is it required reading for the partners. I actually have mixed feelings about it being required reading. Also, I agree it would be nice for HS to go back to the roots of the company. @purple1 – The store partners each get one free copy of the book which is a “partner edition.” It is NOT required reading. I suspect we’ll see a few of them end up ebay! I hope though that many partners will be inspired to read the book. Thanks for the review & the sneak peek! Hi Kristen! Welcome to the blog!! I do like Sumatra, though I think it’s best from the Clover. Even better than from a press. I’m not sure why, but an amazingly perfect pairing is the mini salted caramel square with a tall Sumatra from the Clover. I’ve been ordering that a lot lately! Sometimes what you pair things with makes an amazing difference. Pike Place Roast with a chocolate donut was the best pairing I’ve had with PPR, and I still don’t like it!! I should have left you my MSI/Twitter name so you’d recognize me, LOL (kitenarie). I did a Sumatra tasting today while I was on shift… I just can’t get into it. It’s the earthy smell… it reminds me of sticks and I can’t get past it. It was good with the oatmeal cookie I paired it with, but that’s as close as I’ll ever get to admitting I like it. Funny though, I do like blends that have Sumatran beans, like Tribute. I typically prefer the more Cocoa-y roasts, like Guatemala Antigua and Verona. I think it is nice partners get the book. What does a partner edition include? Is HS writing a special note to them? I love your enthusiasm and passion in this post, Mel. I agree that Pike Place Roast hasn’t done much for the aroma of the stores, but at least Howard’s heart was in the right place with that decision. @Melody: I asked the partners at my place when they will get the book. They said Friday, the 25th. There is also a “book tour”…H.S. will be in Beverly Hills talking about his book to select partners…my favorite manager is going, but others weren’t invited. Not sure how they determined who got invited. @deniser and @karldahlquist – Denise, the 25th seems so late! I realize it is only a few days away but it feels like forever somehow! @Karl – I’ve heard about the book tour. Every once in a while I see tweets pop up here and there that say something like “Howard is speaking at xyz place!” and basically I get the impression that his travel schedule will soon be insane. I assume that there will be events here in Seattle, but none specific that I know about. I have to admit, a part of me has wondered how he can run a corporation while touring the world like a rock star on a big concert tour, but I guess he can! @Andrew – I thought the same thing too. But Pike Place Roast is one the transformation changes that annoys the heck out of me, because they’re a specialty coffeehouse. It’s done now. It’s been three years – doubt anything will change now. @DeniseR – One more thing! 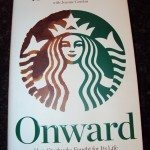 I need to say thank you for ordering Onward! This blog is a big moneysink so having even a few people order the book (or other things!) tickles me pink. So far, I have sold four copies of Onward through the widget on this site, and a variety of other things too. I now could go out for dinner at Burgermaster in Seattle on my earnings. 😉 Good thing Jim and I like eating at Burgermaster. Melody: Great book review. As I have heard Howard speak a number of times as well, this book did sound very genuine and authentic, and reinvigorated my love of my job. 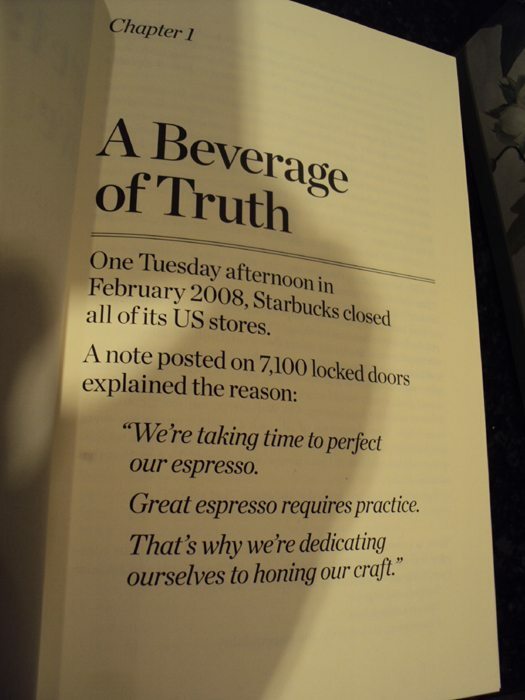 I have worked at Starbucks now for over 13 years, and love that even when we make mistakes, the company (and Howard) can admit them and move forward, and really, follow the Mission Statement the majority of the time. 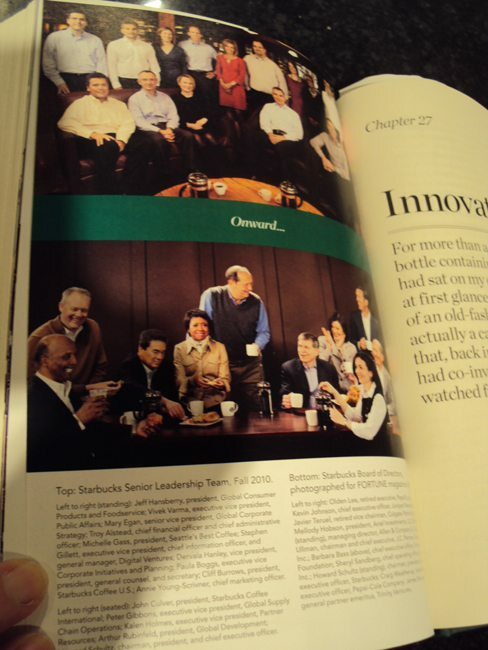 The only thing I noticed missing was perhaps a bit more insight into some other “big names” who left Starbucks as we introduced the Transformational Agenda…..but all in all, it is a great recap of the last few years of the company, and will hoefully help more customers (and partners) understand some of the behind the scenes thinking that guided us through it. Do you get paid for Kindle purchases too? I have to remember to buy from your website instead of directly from my Kindle. (Bought some applesauce and a kindle gift book today through your link). Thanks Melody for another fantastic post, I really enjoy your book reviews and always end up purchasing the books right after finishing your review – today being no exception! Can’t wait for it to arrive! Talk to you soon, and I hope you are well! I really think HS should have talks with all the partners with a question and answer session as you goes on his book tour. These events are only by invitation? I realize it might be impossible for him to meet all the partners, but it would be nice for them to feel part of the corporation and give direct feedback to him. Re his managing the corp while he is on tour, I am sure with the way the tech world is he will do it just fine. @AmazonV – I deleted the duplicate comment. I thought about that!These days there is even internet way up high in the sky now& I was thinking it could be possible that the time sitting in a plane, un-distracted by people walking in your office, >could< be really productive! @MatthewFroese As I recall, you only very recently left Starbucks? Anyway, when you finish the book, tell me what you think! Thanks for dropping by, as always! Helluva review. 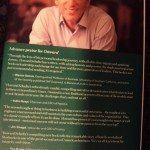 I’m really psyched to read the book and even more excited to see Howard Schultz at the partner event in Chicago on April 11th! Thanks for reviewing the book Melody! I haven’t read the book yet but supposedly we will be receiving the partner edition soon at my store. 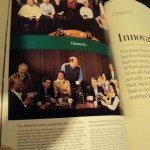 I find it interesting that Howard would mention espresso excellence training in the book since many key points of the training have since been reversed. I’m sure it will be an interesting, though PR heavy, read. It’s a great read. I read every word. Had to actually, I am the narrator of the audiobook version coming out in mid-April for Highbridge Audio. I really liked the book in a big way. It has such a great low key honesty and authenticity to it. I real legitimate peek behind the counter, as it were. 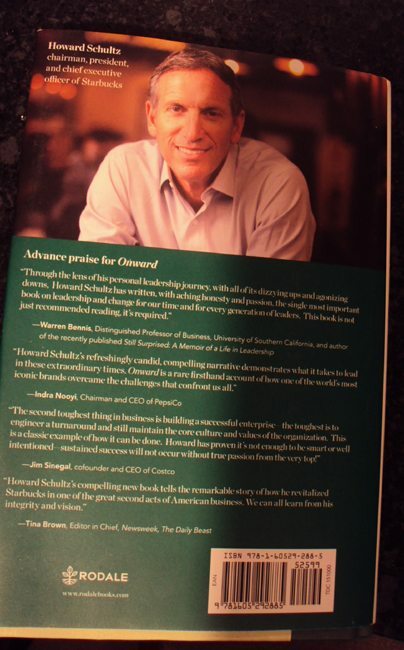 Loved reading your review of Onward! I can’t wait to read it myself. I’ve already pre-ordered a copy! (Love that 40% off! ;)) Reading your review has me even more enthused to read it. Very well written. And how cool about getting to order it early thanks to an Amazon flub. Awesome! @StephenBowlby – Thank you for stopping by! How cool that we get to meet the ‘voice’ of the narrated version of Onward. 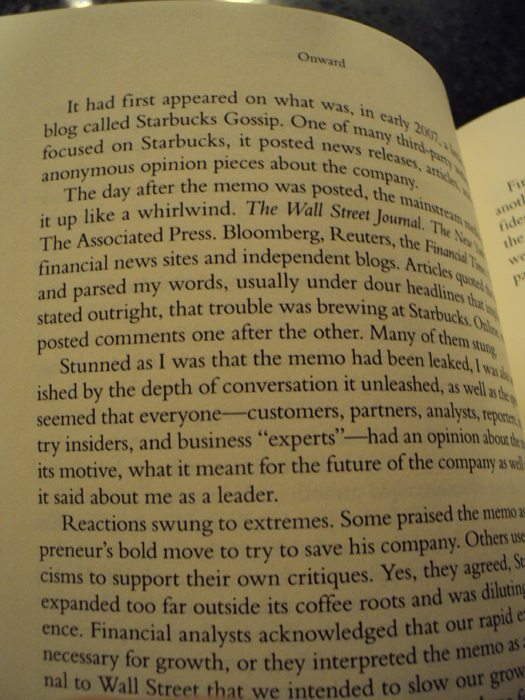 The book does sound just like Howard Schultz talks. 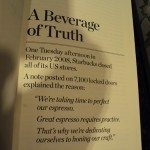 I was telling this to a corporate partner at the Shareholders meeting yesterday, and he agreed, and said that there are phrases and ways of saying things in the book that only Howard Schultz would say! Very signature Howard Schultz style! @Pencil_to_paper – Come back and tell us what you think once you read it. I think people who are reading it are mostly liking it – at least that is my sense from here and from twitter. 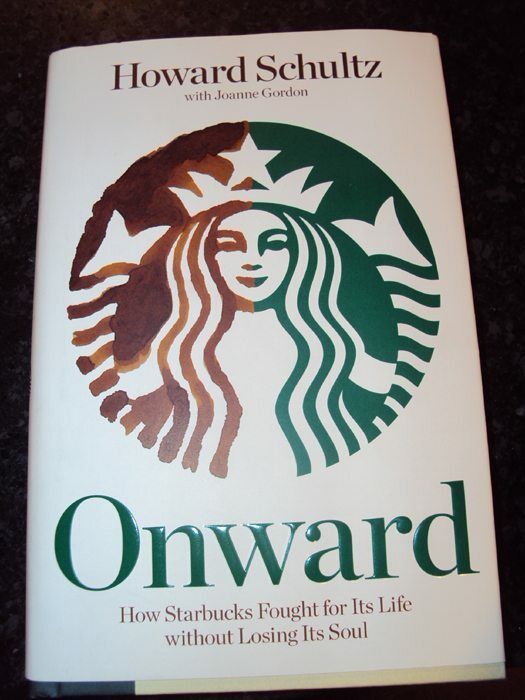 I’m going to end up with several copies because I bought the one from Amazon, and then I pre-ordered one yesterday to get the Onward Card, and then I bought one when there was that MyStarbucksRewards promotion – I think it was like 40% off! That’s a lot of Onward. And I will now and then check ebay for a partner version that turns up there. I think I’d like to see a partner version. I don’t know what’s extra. Would be cool if there is an extra chapter. @Harrison – You lucky duck!!! Very cool you’re going to a partner event with Howard. @Melody: every partner at my place got their own copy (of ‘Onward’) today…along with their new very cool…partner cards….and the Onward Sbux card, and some kind of bookmark….which they’re not ‘supposed to sell’ , or something. So, it was (at least here) a book/partner. Plus, new “Onward” gift cards are due out for the public next week..I assume ~ the release date. and, more around here which I’ll e-to-you. Melody, you can pre-order and get the Onward card?? @deniseR I didn’t know about the Onward bookmark! Very cool. I’ve been hearing partners mention they got their books. I’m interested to see how it sells in the stores. 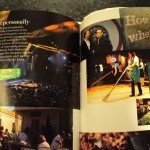 @Pencil_to_paper – From what I know, the Onward Starbucks Card was available at the Shareholders meeting (if you pre-ordered the book there) OR it will be available in the stores for a limited time when you buy the book in the stores. That’s all I know! Denise R your comment re the age of the partners and their understanding of the SB experience truly hit home for me especially this morning at my local SB because I asked the partners there if they got there copies of the HS book and their reaction was sort of a blank stare- the book was in the back not yet opened and they seemed to have no interest in it at all. My eagerness to discuss it and also find out what makes it different than the regular copy just went over them. I find this more often than not and I am sort of hoping that HS brings back the spirit to the partners so it is not just a job and they communicate more with the customers. Certainly, these two partners know me well.